November 5th marks the 90th anniversary of the day that the last emperor of China, known as “boy emperor” Puyi was expelled from the Forbidden City, a place he was confined to live all 18 years of his life. This walking tour will recount the 13 years leading up to Puyi’s ousting, a strange period of limbo where Dynasty and Republic coexisted within the confines of the Forbidden City. 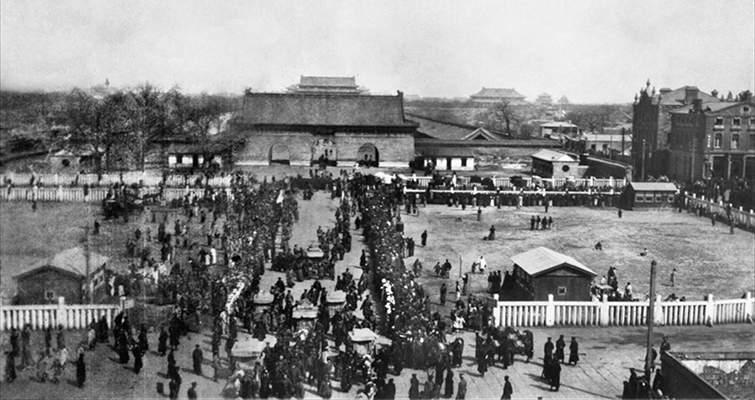 The funeral procession of Empress Dowager Longyu, 1912. 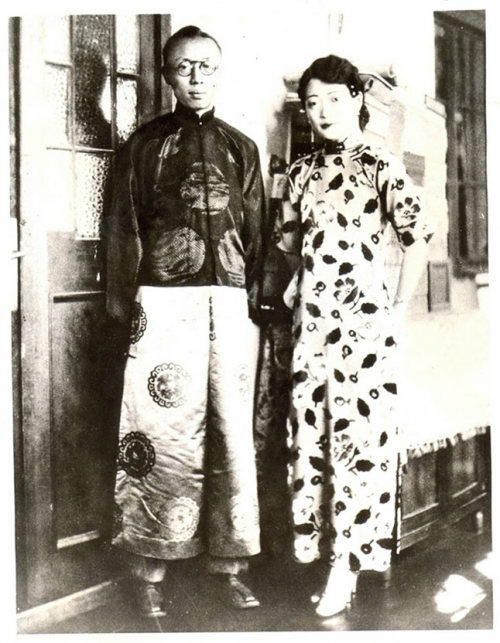 She signed the abdication papers for the boy emperor Puyi. This walking tour is a limited edition (taking place on 6 different dates: October 17, 19, 25, 26, November 1, 2), there will be 20 spots open to the public on a first-come, first-book basis. “Designed for history buffs and those feeling jaded with the ‘standard’ Forbidden City experience, this Limited Edition public walking tour invites you to venture into the areas of the Forbidden City where Puyi lived and studied under his eccentric British tutor Reginald Johnson (memorably played by Peter O’Toole in Bertolucci’s 1987 film The Last Emperor), and discover the collision of cultures and sensibilities that resulted from the very first foreigner being permitted into the emperor’s inner sanctum. You’ll also discover how the Forbidden City became a museum just one year after Puyi’s departure, a calculated maneuver designed to relegate the remains of the Qing dynasty to history.” – Bespoke Beijing Travel Co.
Bespoke Beijing: What is the general feeling about Puyi now from most Chinese people? Lars: The general feeling is that Puyi was rather weak and doesn’t have great historical significance. He is called the “puppet emperor” and to a large extent that’s what he was. However, I would say that he’s not a bad guy. I think he wanted to do good but ended up committing grave mistakes in siding with the Japanese. Yet it’s somehow an achievement how he was able to go from being emperor to a normal citizen. It’s interesting when you look at the footage of him in the Communist years – he looks much happier than when he was emperor. BB: Under the Communists, was life hard for Puyi? Lars: He was imprisoned in Russia in 1945 for four years, and handed back in 1950 after the formation of the People’s Republic of China. He then spent nine years in prison / re-education camp, writing self criticisms. He was released as a reformed member of society and worked at the Botanical Gardens in Beijing. In the early 1960s he was commissioned by the CPC to write his book, so it’s very much an “approved”, censored work. BB: What’s your favorite aspect of “From Dynasty to Republic”? Lars: Well, I think one of the most interesting characters is Puyi’s English tutor Reginald Johnston. He’s very different to how he was portrayed by Peter O’Toole in The Last Emperor. He was extremely eccentric and you might even say crazy. He dreamed up several fantasy creatures that he wrote about in children’s books (unpublished), and some of these he even mentions in official reports. Supposedly when Johnston was working for the colonial office in Hong Kong in his early twenties, his room mate had to move out because he found all the talk of imaginary creatures intolerable. I’ve checked with the Bespoke team and although both October 19th and November 2nd walking tours are sold out, but there are still a handful of tickets remaining for the other dates listed below! Please note that tickets are not guaranteed until payment has been made (either paid online with Yoopay link or paid in cash to the Bespoke office at Beixinqiao). Tickets are sold on a first come, first served basis, so don’t miss out! The walking tour looks very interesting and you have written such a wonderful, comprehensive article about it, Kristen. Thank you @SueandIan! I look forward to hearing your feedback about the tour when I see you at dinner this Friday!